The 10 Best BBQ Joints in Iowa! When you think of a great barbecue, those familiar smells come to mind: Marinated meat slow cooking in a pit, surrounded by hickory chips and other flavored woods. Hungry yet? If you happen to be in the state of Iowa, you’re in luck, because spread throughout the state are many award-winning barbecue joints. Here are the 10 best. Featuring six locations all over the Des Moines Metro, including Johnston, Altoona, Ankeny, two in West Des Moines and their original location of the Drake neighborhood in Des Moines, the most significant factor of Jethro’s growth over the past few years is their downright delicious food. Each Jethro’s location has a unique flavor embedded into their deep menu, and the Johnston location specializes in mouth-watering pork chops that can’t be beat. Check it yourself, and be sure to stop by all the locations, and see why Jethro’s is on top of the list when it comes to best barbecue joints in Iowa. Featuring two locations in the Iowa City area, Jimmy Jacks Rib Shack is fairly new to the already celebrated Iowa City culinary scene. But with their drool-inducing entrees and award-winning recipes, Jimmy Jacks has already cemented themselves as an Iowa City staple. Whether you’re looking for some professional catering or just a quick bite to eat, with so many barbecue choices to choose from, and just as many sauces to lather things up, your first visit to Jimmy Jacks is guaranteed not to be your last. If the long list of local, regional and national barbecue awards that Smokey D’s has amassed doesn’t convince you try out this central Iowa barbecue joint, one taste of the award-winning fares will. Featuring wings, ribs, pit ham, beef brisket and so much more, even the side items and comfort foods like the mac & cheese or house-made chili are worth mentioning. With three convenient locations in the Des Moines area, the real treat is to take advantage of the Smokey D’s catering menu which can bring all the flavor to your house or special location. For some local flavor and some of the best barbecue in the state of Iowa, Vinny’s barbecue in Dakota City delivers on everything you need for a great dining experience. Featuring a long menu full of barbecue options and sauces, the ambiance of Vinny’s also adds to the meal. Whether it’s the smoky smell of meats being prepared, or the friendly faces to share seats amongst, maybe even the long bar that’s perfect to prop your elbows up and enjoy your meal, it’s the whole barbecue experience that makes Vinny’s one of the best in the state. Serving the Decorah community since 2012, Old Armory BBQ has mounted quite the reputation for providing some of the best slow-cooked meats and homemade sauces in the state. Much of that reputation stems from their long menu of appetizers, platters and much more, including burgers, sandwiches and salads. Whatever entree item catches your eye on your next visit to Old Armory, it will leave you satisfied and wanting to come back for more. With a stated mission to feed your inner soul, Flatted Fifth Blues & BBQ meets that task by providing not only some award-winning food, but by providing the ambiance for a great eating experience. Located in a fully restored, 170-year-old Grist Mill in Bellevue, this updated area of history really enhances the slow-cooked flavors of Flatted Fifth’s brisket, jambalaya and Iowa ribs. Pair the award-winning food at Flatted Fifths with the constant rotation of live music being performed alongside your meal, and you’ll see why everyone who visits this celebrated space decides to stay awhile. Touted as barbecue that can make a grown man cry, the dedication towards quality is easily apparent as you give your order at this Ottumwa restaurant. Bubba-Q’s originally started as a small catering business, and through popularity of their hand-picked meats, self-rubbed marinades and award-winning sauces, now operates two sit down restaurants in the Ottumwa area. Much, if not all of Bubba-Q’s entrees are prepared pit style, meaning much of the meat you’re eating from Bubba-Q’s has spent 12-plus hours simmering in flavor, making each bite one the best barbecue experiences of your life. 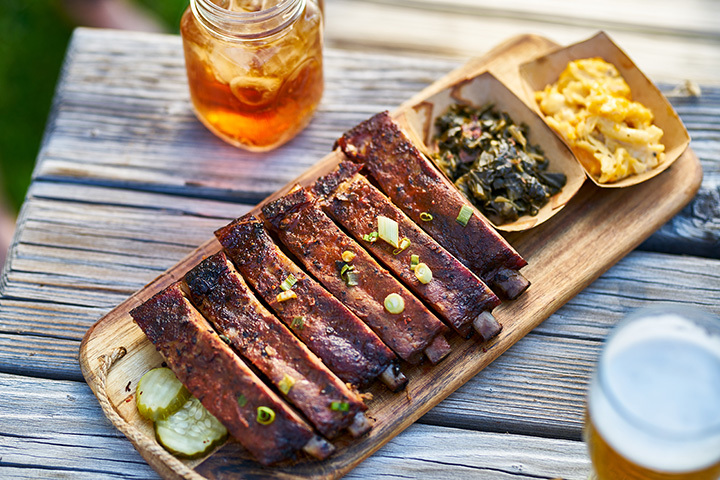 Featuring a wide menu of delectable side items including collard greens, bacon jars and the lightest cornbread in the state of Iowa, the real reason to visit Mosley’s in Iowa City is the goods found on the hickory fire pit. Low heat and long cook times is part of the recipe for cooking meats at Moseley's, and with each bite you can taste the time it took to get there. Add in the fact that every ingredient in the house comes from local Iowa farms, and you can not only expect a fresh taste at Mosley’s, but know that you are supporting the community in doing so. Guru BBQ in Des Moines isn’t your ordinary barbecue joint, and while they do provide some slow-cooked staples like chopped pork, brisket and andouille sausage, it’s the wide mix of spices and international flavors they blend together that sets Guru BBQ apart from the rest. Featuring unique entrees like pork and apple melt sandwiches, chocolate bacon bacon chili and chipotle honey tacos, you’re sure to find something new with each visit to Guru BBQ, and something that will soon be your new favorite. Featuring sandwiches, combos and dinner plates, Jimmy’s Barbecue Pit in Boone is your one-stop shop for all your barbecue needs. With a friendly staff and comfortable place to eat, if you feel like eating this delicious barbecue elsewhere, Jimmy’s also provides an easy online ordering system that can have you picking up your food and eating it wherever you like. Just don’t forget to grab some extra sauce for whatever you order because while the meat entrees and side dishes stand strong on their own, the homemade sauces really add the final flavor towards a great barbecue experience.